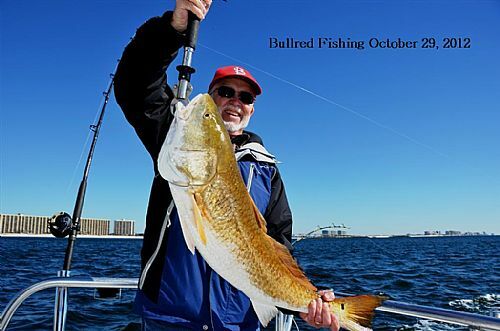 Fall of the year provides some of the best fishing opportunities on the Alabama Gulf Coast. The cooler temperatures bring in the Bull Redfish right off the beach. These big Bullreds as we call them school up and we take you out on the charter boat and go back and forth along the shoreline until we see birds working or fish busting top-water. These fish show up near the Perdido Key line, in front of Orange Beach and all the way west toward Gulf Shores and Fort Morgan. They mostly stay in water that is 18 to 30 feet in depth. We drag lines with Mann’s bait, stretch 30’s with 80 pound test 50 to 80 yards behind the rear of the charter boat. The baits have deep diving bills on them that make the bait dig and shake a lot while moving. Big redfish will come and knock the fire out of them and then you get to reel them in. When the fishing is red hot and there are acres of them feeding on top-water, you can cast a lead head jig with a curly tail plastic out to them using a spinning rod. Some people use frozen bait called pogies because they give off an oily odor to attract them. Surprisingly, when they are feeding, you don’t need all that. They stir the water up and make it muddy, but they can easily find the bait your casting or trolling. Come along during the month of November and December 2012 and lets do some trolling and sightcasting for them.